THIS UNIT WILL DIG A 4" TO 10" HOLE. ANY HOLE LARGER THAN 10" REQUIRES A HYDRAULIC AUGER. 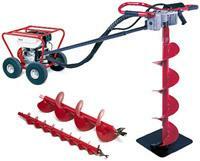 * Please call us with any questions about our little beaver auger rentals in Lake Charles and Moss Bluff LA.